Spring is in the air in Latvia! Located along the Baltic Sea between Lithuania and Estonia, the beautiful landscape includes large beaches and dense forests. Drone pilot and cinematographer Jurgis Kreilis / FilmDay shows us views of both as the country starts thawing for spring. Featuring top-down shots of chunks of ice as they break apart in the rivers and wide shots of the lakes opening up for spring, this drone video will get you in the mood for warmer weather! Description: Spring is in the air. The white blanket is melting. Days get longer, brighter and warmer, while temperature at night still fall below 0°C. Typically, it takes time for Spring to overcome Winter and the rivalry is still on. 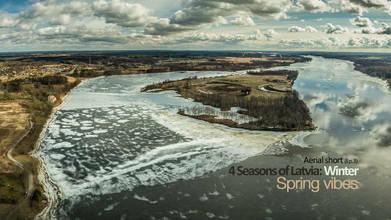 Third drone video episode of "4 Season of Latvia" series brings you a handful moments of Spring "taste" you can experience during the end of the Winter season. We call them - Spring vibes.